The Wardrobe is (CTS)'s must-have: an easy-to-use organizer for your outfits. 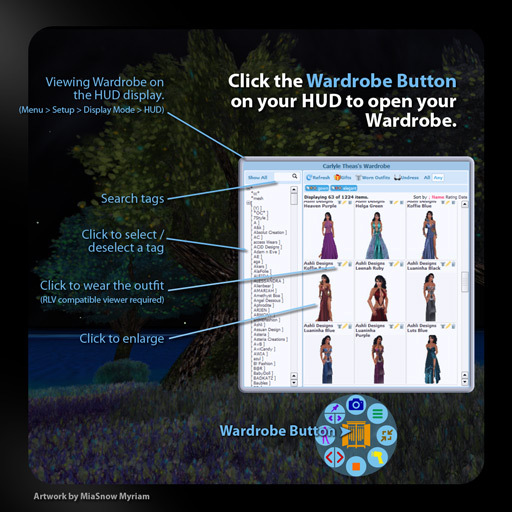 The Wardrobe HUD gives you access to your personal Wardrobe website, to which you upload snapshots of your outfits, and from which you can wear them directly. — Choose the outfit you want to wear visually. Wear it directly from your Wardrobe page. — Categorize your outfits with tags and find them again easily by selecting the tags of the outfit you are looking for. Add as many tags as you want, and your outfit is in multiple categories at once. You are no longer limited by SL's inventory structure. 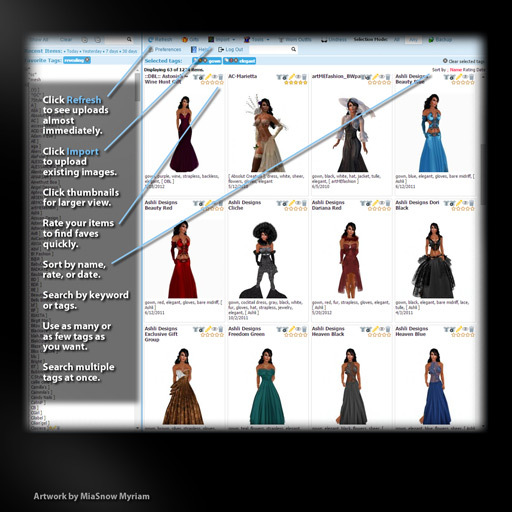 See all your gowns or all your red outfits or all your outfits with buckles (or whatever) with one click at one glance! — No paying fees to upload textures with snapshots of your outfits, no waiting for textures to load! — Show your Wardrobe to others in the inworld rezzable closet. — Receive a number of free gifts from selected designers and creators to get you started with the Wardrobe! — Buttacwup Pwincess's Video Tutorials. — Victoria Fairlady's Video Tutorials. Get it on the Second Life Marketplace. Take snapshots of your outfits or import them directly from a Marketplace listing, tag them with as many tags as you like, and upload them to your Wardrobe. No upload fees. Ever. Don't put an outfit on to see what it looks like. Take a snapshot once (best just after you buy it) and you'll have it in your Wardrobe forever. Wear outfits with one click directly from your Wardrobe webpage. SL textures load slowly. 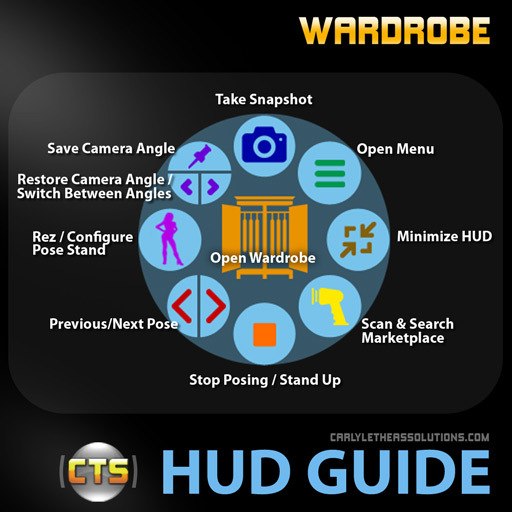 No need to wait for your texture snapshots of outfits them to rez anymore to see what an outfit looks like. Just open your Wardrobe, and voila! Tags allow you to put outfits in many categories. It has never been so easy to see all your classy gowns or your purple clothes or your grungy pants or ... whatever... at once glance. Find your outfits by tags on the Wardrobe website. Simply click the tags that match your search criteria, and you will get a list of all outfits that have the tag you selected. We guarantee that the website stays available. No recurring payments to use the website. You have already taken snapshots of outfits? No problem! 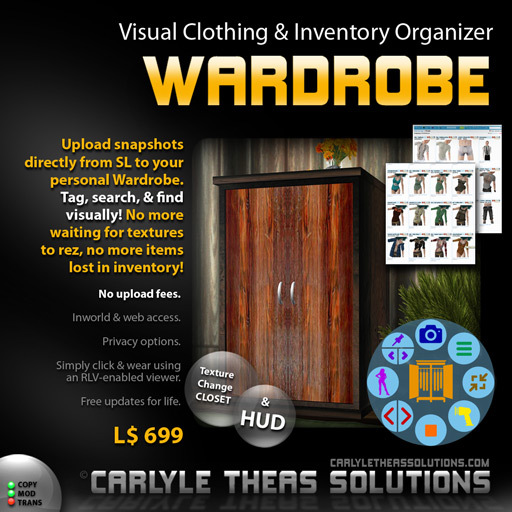 You can easily upload existing textures into your Wardrobe. 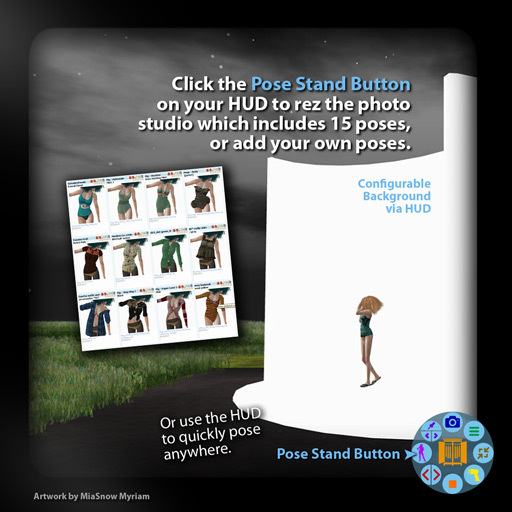 You can use the Wardrobe HUD for posing to take snapshots, 15 poses are included. You may add as many of your own poses as you wish. No need to rez balls, the HUD works everywhere. Wardrobe also comes with a special pose stand. The configurable pose stand's backdrop turns it into a mini photo studio. Wardrobe comes with a nice closet that you can rez inworld. It allows you to view your Wardrobe webpage and show it to friends. A variety of closet styles is available. Special thanks to Cobalt27 Resident from CobyDot Product. 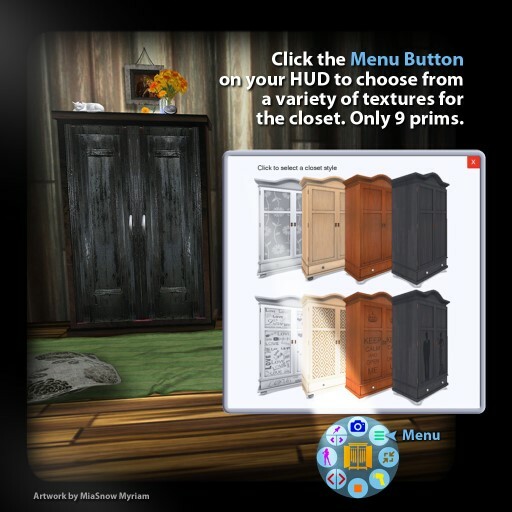 Wardrobe users can choose from a variety of gifts to get started with their Wardrobes. Click here to proceed to the Wardrobe manual. If you want to stay up to date and receive Wardrobe goodies, or discuss your usage or best practice of the Wardrobe with other users, feel free to join the group. Click here to see blog posts and reviews from Wardrobe users.